We are absolutely thrilled to announce our support of summer campers at the Alliance for the Arts. During the month of May, a portion of our revenue from every real estate closing will be donated to the Alliance to fund scholarships for summer camp tuition. 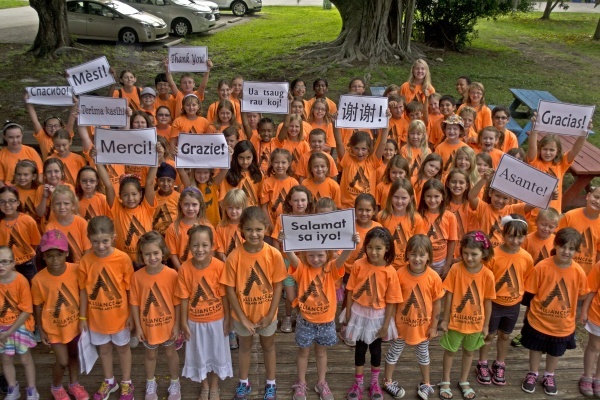 “The Alliance for the Arts is the state designated arts agency for Lee County; a member supported non-profit with a passion to facilitate and nurture the creation, development, promotion, and education of arts and culture.” There is no place better to witness the Alliance’s fulfillment of that passion than at its Summer Arts Camps. Kids aged 5 to 12 from all walks of life fill the Alliance eight weeks during the summer, lifting their voices, moving their feet and creating an array of visual arts. And each week culminates final stage performances which are an absolute riot. Take a look for yourself. We are sold on the arts and their positive impact on the children of Southwest Florida. Here’s proof. If you’d like to learn more about the Alliance, check them out at ArtInLee.org. Thanks so much for your support! Oh, and the kids say thanks too! Making community connections is a part of the Winged Foot Title company philosophy. For them, business is about more than closings and real estate; it’s about making a difference. In the winter of 2014, Winged Foot Title actively participated in this mission. 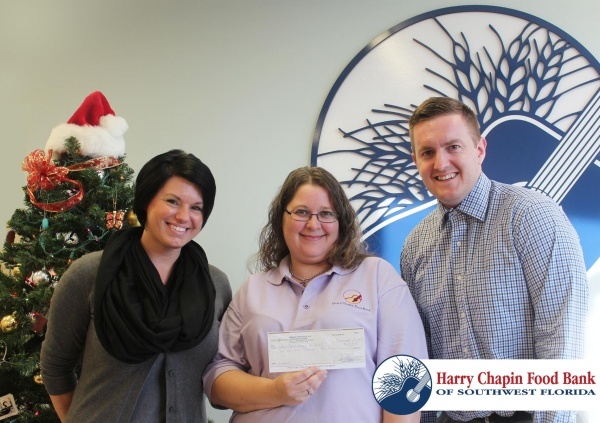 Winged Foot Title staffers Kristen, Johanna, and Jared delivered the company’s November and December 2014 donation to Harry Chapin Food Bank. This holiday season, Winged Foot Title, LLC raised awareness and gave back to the community through a campaign benefitting Harry Chapin Food Bank of Southwest Florida. For every closing in November and December 2014, the company donated a portion to help feed the hungry in Southwest Florida. They raised $520 in just two short months. Through its resources, Harry Chapin Food Bank can multiply every $1 in cash donations into $6 in food value. “Many families and children will benefit from this partnership, through this holiday season and beyond.” Sam Kelly of the Harry Chapin Food Bank said. Winged Foot Title Owner Chris Black says they will continue Closing with a Cause into the new year, next benefitting the Boys and Girls Club of Southwest Florida. 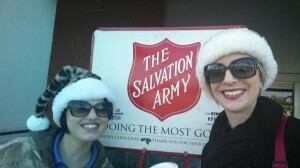 Kristen and Jillian participate as Salvation Army Bell Ringers for Winged Foot Title. 90¢ of every dollar raised by the Lee, Hendry, Glades Counties Command supports its programs. The Salvation Army assists more than 33 million individuals throughout the year in the United States – over 6 million of those during the holiday season alone. Since the series began in 2010, Winged Foot Title has been a dedicated sponsor of Family Movie Nights at the Alliance for the Arts. 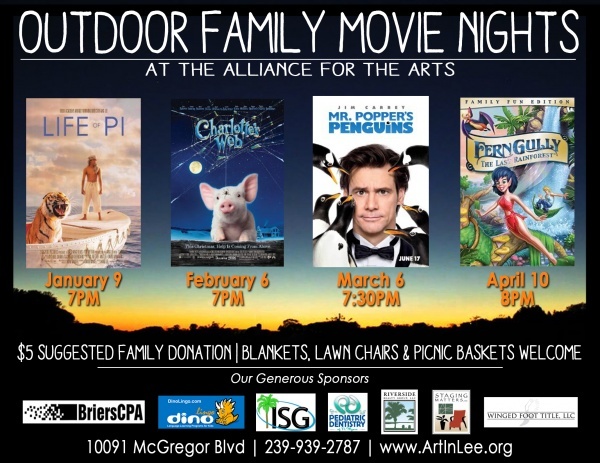 All funds collected for Family Movie Nights supports the organization’s extensive children’s programming. This season began with a screening of The Life of Pi on January 9, and continues Friday, February 6 at 7 p.m. with Charlotte’s Web, Friday, March 6 at 7:30 p.m. with Mr. Popper’s Penguins, and concludes on Friday April 10 at 8 p.m. with Fern Gully: The Last Rainforest. The Alliance for the Arts proudly supports artists and art organizations in our area as the state designated Local Arts Agency for Lee County. Construction’s Begun on Winged Foot Title’s New Home! NOT LEGAL ADVICE: This information is not to be construed as legal advice. Legal advice must be tailored to the specific circumstances of each case. Every effort has been made to assure that this information is up-to-date as of the date of publication. It is not intended to be a full and exhaustive explanation of the law in any area. This information is not intended as legal advice and may not be used as legal advice. It should not be used to replace the advice of your own legal counsel. Winged Foot Tite, LLC is not associated with the government, and our [short sale orchestration] service is not approved by the government or your lender. Even if you accept this offer and use our service, your lender may not agree to change your loan.